To provide a positive creative and learning environment, with exhibition and studio facilities, to enable promotion and fostering of our members’ practice and the wider Mangawhai community’s appreciation of all forms of art. 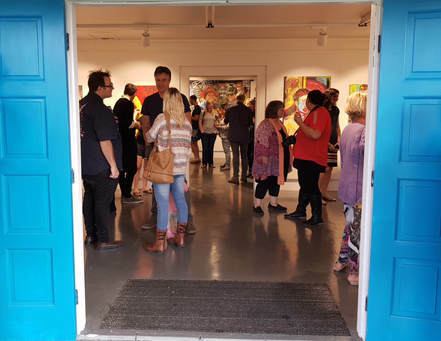 The inaugural event of the The Friends of Mangawhai Artists was held on December 1, 2018. Mangawhai Artists are a deserving winner of the Not for Profit category. The unity with which they operate is clearly evident - a large group of people working co-operatively with a very clear focus to instigate and complete ambitious building programmes, run innovative exhibitions and workshops for the local community and support local artists both at home and away. The obvious enjoyment and efficiency of this group made it a pleasure to judge. Beautiful New Zealand scenery and over a hundred talented artists inspired by their environment! The Mangawhai area inspires painters and photographers, mosaic, ceramic, wood and glass artists, sculptors, jewellery makers, weavers and many other artists. ​You can see their work in exhibitions organised by Mangawhai Artists Inc at our Gallery at 45 Moir Street, at local studios by appointment, as well as in our Easter Art Trail. Art and creativity are among the special features of Mangawhai, where you can also enjoy Bennetts Chocolatier and Cafe, the modern Mangawhai Museum, vineyards, cafes, tavern, restaurants, beaches and many walks. it is together that we make wonderful things happen! The Ashfords Picture Framing, Snapper Rock Wines and Hierographics. To sponsors of The Kaipara Art Awards: The Kaipara Lifestyler, Pub Charities Ltd, Westmoreland Homes, Mangawhai Optometrists - Eyes on the Heads, Flax & Fibre. To sponsors of MAI Community Projects: Kaipara District Creative Communities NZ, Resene - Paints the Professionals use. we love creating together an even more magical Mangawhai! Mangawhai coastal village is 90 minutes north of Auckland and 45 minutes ​south of Whangarei.